A knife is one of the most important kitchen utensils. Traditional, continental, French, Italian, Japanese, Chinese, oriental or any other food is to be prepared. Or simply to cut open a nut, fruit or vegetable a knife is the equipment that is required to split the raw food open so that it can all be mixed and devoured. The storage of these knives all available in different size and shapes need space for loading it. The storage should be in a manner that it is clatter free, space is utilized to its maximum and the knife which is required is easily available. As a solution to this problem wall mounting panels were introduced to hang in knives. The conventional hangers had hooks; the knife was suspended from the handle with the edge dangling in midair. This could give way to accidents. As a further solution to this problem we now have magnetic knife hangers. This make in use of magnetic force to bind together the knife blades with the magnet strips or blocks whatever the case may be. Above or near a wall of the sink is an important spot. Once after washing it can be hung for drying immediately. Near a stove; as oven is the place where food is cooked therefore instant cutting and cooking can take place. Inside a cabinet door, this conceals the knife display away from the children along with not using the cabinet space. Therefore it is a part of the cabinet and yet using the idle door space. On any wall space to enhance its beauty or to use the empty space. Below a window or cabinet frame. This basically hides the body of the holder especially under the cabinet, but is termed to be the best way of using these walls which otherwise have no such use. This guide provides the features of the most popular magnetic strips, blocks, racks and handles. The basic feature is the same of using magnetic attractions for knives accommodation. The difference is in the shape, size counter top placing or wall suspenders. The force of magnets is used to hold knife, such a holder can be attached on the wall, thus an ideal storage device for small kitchens. The MIU stainless steel magnetic knife holder is available for a price of $50. It is a wall mounting device available in lengths of 15 and 20 inches. It is 2 inches thick and ¾ inches wide. It is made with durable and shining stainless steel with a secure magnetic hold. 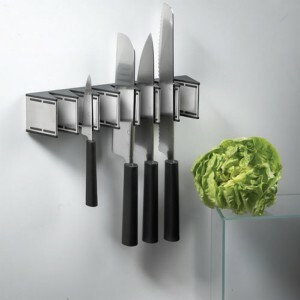 It is highly sturdy with good strength, good quality and huge space to display your cutlery. Update international Magnetic tool holder is available for $15. The holder weighs one pound and the dimensions are 24.8*1.5*0.4 inches. It is made from plastic and is painted black. It has two magnetic strips along the length of the holder to hold onto knives and 5 other hooks to suspend nonmagnetic utensils. It is accompanied with mounting screws, though they are a little small, therefore a flat area of wall should be used to mount it. The major positive point of this holder is that it is a complete utensil hanger, along with knives other handy gadgets can also be put on display. This as the name symbolizes refers to a strip of magnet on which knives can be hung. These are thin strips which take less space and can be hung easily on any high mounted space, wide enough for all the knives to be placed. In studio apartments with small kitchens this has become an ideal choice for knife stowing. There are many such strips available in the market as the demand has increased with the passage of time. The Ouddy aluminum magnetic knife strip is a convenient cutlery and knife storage tool. A 22 inch long bar, and width of 2 inches, made from the light weighted non corrosive aluminum, with two strips of strong magnet bars extending to the entire length; with a list price of $30. There are two mounting holes 14 inches apart from each other. The magnets are strong enough to hold heavy knives and scissors thus making it a cost effective buy. With a list price of $20, weight of 1.84 pounds, made of metal and painted in bright black, TableCraft Plastic Base Magnetic Bar Knife Strip is another great purchase. The length is 24 inches and dual magnetic strips are attached to it. There are 6 hooks to mount it on the wall, but with a plastic base a little care and precision needs to be taken care of when pedestalling on the wall to avoid curving the strip. In this case instead of a strip a whole block of magnet concealed behind a piece of wood or any such material is used to arrange knives. This apparatus is usually placed on flat surfaces and is more sturdy and with a stronger magnetic force to grip the utensils. Magnetic knife block by Good Cooking is a robust board constructed of hardwood. It has strong magnets to hold on knives. The area of the board 10 inches*8.75 inches and the list price is $30. It is a unique way to assemble knives as the board has a sleek and stylish design. Using wood block the main board is suspended at an angle like a photo frame. This makes the handling of knives easier. Solicit magnetic knife block made from beech wood also has the same features and shape. The weight of the board is 4.2 pounds and it can store in five knives only. Swissmar Bamboo Magnetic Knife Block is an extremely pretty utensil for ones countertop. The height of the block is 9.37 inches and the length is 8.62 inches. It means that knives to almost 9 inches can be placed in the block. It has a two sided storage space. The maximum numbers of knives that can be stored are eight to nine knives. The base is of 3 inches which means that it will not cover much space of countertop. The covering of Plexiglas on both side not only enhance the beauty of the block but also ensure that that knifes are strongly placed. This also provides a covering for the blades and prevents accidental cuts and nicks. The basic structure of a conventional rack has been modernized with the use of magnets. These magnetic knife racks have amalgamated the benefits of both racks and magnets. The Henckels magnetic knife rack has the list price of $58. The patented Henckels signature pattern and ice hardening technology ensure the quality is to its maximum best. The length of this rack is 45 cm. The display of eight knives, five large and three small can be made. Another rack with a list price of merely $13, in color black and length of 18 inches by Cutting edge Cookware is a cost effective product. It is well designed, easy to fix rack. The screws for mounting it are all available with the product. It is also accompanied with a lifetime warranty which adds to its benefits and the reason for a high demand. All these racks, holders and strips have both their pros and cons. Like every other aspect of advanced equipment these utensils also need to be taken care of. Proper cleaning and wiping to keep of dust, water and rust should be performed. The major drawback of such a display or hanging equipment is that it can be dangerous if you have small children or animal around. A child may take hold of a knife mishandling may lead to serious injuries. Therefore either such things should not be used or one should properly ensure that they are at a spot which is not accessible by a toddler or pet. The positive aspect is that these hangers are space savers, custom made for kitchens that have limited number of cabinets and counter top space. These ensure that knife edges do not rub together as they used to in drawers therefore prolonging the sharpness of the edge and life of the knife. It is convenient to use and is a good form to display your expensive knives. I would suggest you try the M.O.C. Woodworks magnetic knife holder, it works great and it will not damage your knifes.